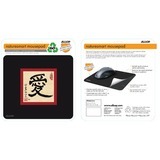 Allsop 30206 Mouse Pad - Blue ASP30206 pg.773. Allsop Accutrack 30202 Mouse Pad - 8.8" x 8" Dimension - Silver ASP30202 pg.774. Clingo 30266 Neklit Multimedia Player Holder - 3.8" x 1.3" x 0.3"
Clingo 30260 Parabolic Sound Sphere Smartphone Holder - 8.1" x 8.1" x 4.5"
Allsop Accutrack Slimline Mouse Pad - Graphite 30201 ASP30201 pg.774. Allsop Keyboard Wrist Rest - 1" x 18" x 2.8" Dimension - Blue - Memory Foam 30204 ASP30204 pg.773.